Play Your Star Wars™ Story – Your Way! Battle to rule the galaxy in Star Wars™: The Old Republic™ – Knights of the Eternal Throne, a bold new digital expansion from BioWare. Be the Outlander and command a team of hand-picked allies as you face one of the most dangerous families in Star Wars™. Mother against daughter. Sister against brother. It’s a fight for control of the throne. You decide who will live, who will die and who will rule the galaxy. Fight to influence the galaxy for the light or dark side of the Force™! Step into your own Star Wars™ story from BioWare, featuring nine chapters, five new levels and two new planets woven into an epic saga where you fight to rule the galaxy. Decide the future of the galaxy and determine the fate of your allies and enemies – your every action drives the galaxy closer to the light or dark side of the Force™. Be The Outlander, a Level 65 veteran of the Great Galactic War, and embark on a handcrafted story-driven saga. Grow your power and influence as you ignite light and dark side battles, fight in new Uprisings and unlock the most powerful rewards – all starting at Level 70 in the new and ongoing Galactic Command system. Join up to three allies in erupting action-packed battles and confront powerful adversaries rising to challenge your influence in Galactic Command. Choose to play any story chapter or battle in three new challenge levels – Story, Veteran, or Master mode – whatever suits your playstyle! The galaxy is erupting in chaos as powerful enemies arise to destroy you. Take Command and Lead your alliance to victory or risk complete annihilation! A galaxy full of new enemies, uneasy alliances, and dangerous choices awaits. Your reign over the galaxy has just begun… it’s up to you to take Command! Game Update 5.10.3 – Has Been Announced! With the renewed war between the Galactic Republic and the Sith Empire, the remote planet Dantooine has taken on sudden significance: its location at the edge of Imperial space makes it a perfect staging area for Republic military ships traveling to and from the front lines. Unable to breach the Republic lines and attack the planet directly, the agents of the Empire have recruited the brutal Nova Blade pirates to attack Dantooine from within the Republic's own territory, catching the planet's defenders completely off guard with the overwhelming violence of their attack. Guild features continue to expand with the addition of Guild Heraldry! Each guild can create their own unique emblem to represent them throughout the game. Join your most trusted allies and make your mark on the galaxy! In addition, the in-game Preview Window has been dramatically improved - weapon, armor, and mount previews are all better than ever before. Plus, now you can also check out emotes, moods, and rest-and-recharge abilities! The Mutated Geonosian Queen and her brood can be found inside of 'The Hive of the Mountain Queen' lair. Progression System - allows active guilds to customize and improve their experience the more they play. PVP Challenge System - Create custom warzones, arenas, and Galactic Starfighter skirmish matches and track your record against other guilds. Game Update 5.9.3 – Now Live! Giradda the Hutt brings the brutal 8v8 spectator sport of Huttball to the giant gas planet of Vandin! Set in an abandoned industrial complex above a large ravine, the new ‘Sky Shredder’ Warzone pits two cross-faction teams of eight, the Frog-Dogs and Rotworms, in a ruthless battle for fame and fortune. Your team’s mission is simple. Grab the ball, throw the ball and work together to take it over the opposing team’s line to score points. At every turn, you’ll have to watch out for deadly pillars of acid fire, electric shock traps and poison gas. NOTE: Fighting and cheating are not only permitted, but highly encouraged! Prepare to make your mark – let’s play Huttball! Game Update 5.9.2 – Now Live! This summer, dominate opponents in fierce Star Wars™ PvP battles across the galaxy and become Galactic Legend! HoloNet News has confirmed the rumors. Giradda the Hutt is constructing his newest Arena of Death, Mandalorian Battle Ring, on the lush and tropical planet of Rishi, bringing the excitement of gladiatorial entertainment to more Arena competitors and spectators alike. Here, your team of four will battle in a 4v4 best-of-three deathmatch and compete for galactic glory, credits, and more! Then expand your influence and acquire your own Rishi Hideout Stronghold. Invite friends to relax with you along the serene coastline or settle scores with opponents as you host your own Free-For-All PvP face-offs in designated battle areas. It’s your Stronghold, your rules! On your path to galactic glory, you will be able to team up cross-faction across all PvP Warzones, Arenas and Galactic Starfighter battles as well as experience faster and improved matchmaking. Plus, get ready for the end of Season 9 and compete for epic new rewards. Giradda invites you to preview and offer your feedback on these latest developments on the Open Public Test Server – live now. Prepare your best battle gear and rise to legend! Expect nothing less than immeasurable brutality in the newest 4v4 Arena, Mandalorian Battle Ring. Fight to the death in teams of four to prove yourself worthy of the legendary warriors of Mandalore. Expand your influence into Rishi and own the galaxy’s biggest Stronghold! Customize your own tropical paradise with stunning views of the mountains above and the beach-front below. For the first time, host and organize your own PvP battles in designated Free-for-All PvP areas including the Hideout Cove and the Skydeck of the Patrol Carrier. From one-on-one duels to large-scale group PvP, any player outside of your group is hostile to you. Aboard the Skydeck, choose between Team Deathmatch and Huttball game modes… or don’t! Battle your way, with your rules! To unlock your new Stronghold, travel to the Fleet, then locate the Strongholds/Crew Skills area. Experience more challenging and compelling PvP battles across the galaxy and compete for Season 9 rewards. Team up cross-faction across all PvP 8v8 Warzones, 4v4 Arenas and 12v12 Galactic Starfighter battles. Enjoy faster queuing and improved matchmaking – more action, less waiting! Prepare for valuable improvements in almost every Warzone. Finally, as Season 9 comes to an end with the Galactic Legend update, compete for new rewards including an impressive new Battleworn Holo-Rancor, Centurion Defender Armor Set and more! A hidden threat obsessed with destroying your alliance forever. A top secret listening post hidden in deep space. Deadly enemies stalking a once-dead world. And in the midst of them all, a longtime ally gone rogue. The traitor saga reaches its dramatic conclusion on the barren world of Nathema as you face a deadly enemy determined to obliterate everything you've built. Across the galaxy, you'll be joined in your battles as old allies return: Felix Iresso, the loyal soldier, Mako, computer slicer and bounty hunter, and Akaavi Spar, the Mandalorian warrior. As your adventures continue, celebrate Star Wars™ in the Old Republic galaxy with our May the 4th festivities including a new Astromech Droid login reward, Premium Player speeder and Double Rewards Event! The hunt for Theron Shan ends with a showdown on the brutal planet of Nathema. Experience your personal storyline solo or join up to three allies to take on tougher challenges in Veteran or Master Mode. Jedi Consulars will learn the tragic circumstances that have kept their longtime ally, Felix Iresso, from fighting at their side as he always had before. Bounty Hunter ally Mako and Smuggler crew member Akaavi have joined forces to become a dangerous duo of bounty hunters in their own right! Your challenge is strengthened by the enthusiastic return of cherished companions: Imperial Agents prepared to reunite with Vector Hyllus, Sith Inquisitors rejoin Ashara Zavros. Additionally, for those who sought to redeem Arcann, the former tyrannical ruler of the Eternal Empire, you will have the chance to take your relationship to a more romantic level… if you choose. The choice is yours as you take command in this latest game update, ‘Command Authority’. The mightiest of the Iokath droid superweapons, Izax is capable of destroying entire fleets of warships – defeating him will require tremendous power and skill! To face Izax, you must first defeat his fellow superweapon, Scyva, in battle. A redeemed Arcann returns and makes his feelings known to those who’ve given him a chance to atone for the evil deeds of his past. Sith Inquisitors get ready to reunite with Ashara Zavros. Guilds of every size will find more challenge, opportunity as well as exciting rewards in our expanded and improved Conquest system. Gather your most powerful allies to fight by your side against the biggest threat to the galaxy, the lethal droid superweapon known as Scyva, Mother of Sorrows. Alongside your group of eight or sixteen players, battle this ancient menace with a passion for destruction and uncover new clues to the origins of this galactic threat as well as some impressive rewards! Your path to destroying Scyva will not be easy, Outlander. As battles rage across the galaxy, you will face Nahut, the superweapon child; only after you and your team successfully rid the galaxy of this terror will you face a more dangerous enemy, bent on your destruction, Scyva. Prepare to celebrate the return of Corso, Risha, and Andronikos! In Legacy of the Creators, these popular allies from the past return to join your Alliance and fight by your side once more! Known as the Mother of Sorrows, Scyva is a nigh-indestructible threat – your team will have to take advantage of every resource at hand to prevail! To face Scyva, you’ll first need to defeat her superweapon child, Nahut, in battle. Risha & Corso emerge from the shadowy galactic underworld to help out their old Smuggler captain. Andronikos plunders the galaxy in search of the Sith Inquisitor he once served so faithfully. Sharpen your skills in Story Mode difficulty, then take your fight to the next level in Veteran Mode! 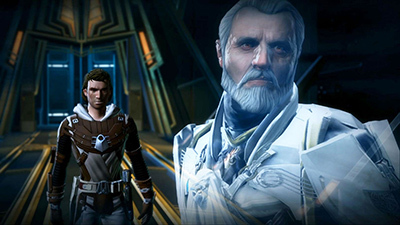 Afterwards, descend into the depths of Iokath to face Nahut – the Son of Shadows – in a brand new Operation boss fight. Your team of 8 or 16 will need to work together to overcome Nahut’s deadly stealth assault. ‘A Traitor Among the Chiss’ also introduces a new Galactic Starfighter map. Pilot your starfighter and rule the skies over Iokath in fierce 12v12 space battles. Plus, experience multiplayer content like never before with a revamped Group Finder, enjoy exciting quality of life improvements, and more! See the full list of updates in the Patch Notes. The traitor has found asylum on the Chiss world of Copero. Lead a covert strike to uncover his deadly plans – before it’s too late! Play with your Companions in Story Mode to continue the storyline where you left off in ‘Crisis on Umbara’. Or, fight with up to three friends and choose from multiple challenge levels: Story, Veteran, and Master Mode. Be wary, Nahut is a master of stealth combat and a superweapon capable of galactic destruction. Hone your skills with Story Mode difficulty, then take your fight to the next level with Veteran Mode! Pilot your Starfighter into 12v12 battle, as galactic forces wage war in orbit over Iokath. Chase down and destroy enemy starfighters in Team Deathmatch mode. Along the way, you can pick up power-ups to turn the tide of battle! Easily join your favorite activities such as Daily Areas, Flashpoints, and Operations. Game Update 5.4 – Now Live! Prepare to lead the ultimate covert assault: battle your way across a moving train, brave the wilds of a dark new world, and more in a high-stakes new Flashpoint! When a deadly traitor is tracked to the shadow-world of Umbara, you’ll need to lead a strike team to confront the betrayer before the galaxy is thrown back into war. With multiple challenge modes available, you can choose to experience the new storyline with your Companions, or fight alongside up to three friends to earn legendary rewards! Take a closer look at the new Flashpoint and Stronghold in the Crisis on Umbara: Gameplay and Rewards Blog, and learn more about the new planet of Umbara in our short story, Trading Scars. ‘Crisis on Umbara’ also introduces exciting new customization options for Senya Tirall, plus new Class combat updates, quality of life improvements, and more! See the full list of updates in the Patch Notes. ** Your access to the ‘Crisis on Umbara’ Flashpoint will vary depending on your character level and the difficulty level you wish to play. Check out the Gameplay and Rewards Blog for more information. The traitor seeking an early end to your reign has been tracked to Umbara! Can you hijack a moving train and confront the betrayer before they escape? Unlock the Umbara Mobile Base by earning Alliance Recon Data from the new Flashpoint, or by cashing in your Credits or Cartel Coins. Game Update 5.3 – Now Live! Rally your team for CARNAGE as the next Operation battle arrives: prepare to face off against the legendary superweapons, Aivela and Esne. Build your elite team of eight or sixteen players and wage war against these twin-sister droids to determine the fate of the galaxy! When the battle is over, unwind on the legendary planet of Manaan in your new Stronghold! Now you can call this water-world home – personalize a sprawling ocean-side estate, complete with panoramic vistas and exotic submarine sights! ‘Sisters of Carnage’ also introduces exciting new Companion Customizations, plus combat updates for Sith Inquisitors, Smugglers, Bounty Hunters, and more! Alliance forces have awakened the ancient twin superweapons, Aivela and Esne! You and your allies will need to work as a team to overcome the combined attacks of both Droid sisters. To face Aivela and Esne, you’ll first need to defeat [their superweapon brother, Tyth], in battle. Find your home in the galaxy with a brand new Stronghold on the aquatic planet of Manaan! Plus, upgrade your pad with the Deepwater Essentials Bundle, a collection of Manaan-themed Decorations available on the Cartel Market! To unlock your new home, travel to the Fleet, then locate the Strongholds/Crew Skills area. For the first time, customize the outfits of Lana Beniko and Koth Vortena! Equip your favorite Sith advisor and Zakuulan pilot in the outfits of your choice! To improve your experience in multiplayer combat, we’ve made a number of balance adjustments to classes like the Sith Inquisitor, Smuggler, and Bounty Hunter. Check out the patch notes for a closer look at the new changes! Game Update 5.2.2 – Now Live! To participate in the Nar Shaddaa Nightlife In-Game Event, travel to Nar Shaddaa from your Player Ship, then take a taxi to either the Star Cluster Casino (Republic) or Club Vertica Casino (Empire). Set course for Nar Shaddaa this summer, as the much-anticipated Nightlife festival makes its triumphant return! Test your luck at the exotic Star Cluster and Club Vertica Casinos, as you compete for this year’s grand prizes! Vectron BWL Wraith: Ride off on this sleek new speeder! Gamorrean Bodyguard Companion: Recruit one of the galaxy's most notorious armed thugs! For the first time, customize the outfits of Theron Shan and Shae Vizla! Equip your favorite Republic agent and bounty hunter sidekicks with fresh new looks! Gunship and Bomber starships are now available for all players, allowing newer pilots to jump in and dominate the skies! We’ve also boosted the rewards earned from space battles and added some exciting new ship customizations. Game Update 5.2 – Now Live! As the Republic and Empire reignite their age-old rivalry in a deadly battle for control of the ultimate superweapon, you alone – as Outlander and commander of the galaxy’s most powerful fleet – can decide the outcome. Choose to align your forces with the Republic or Empire in a brand new storyline, explore the ancient and highly-advanced planet of Iokath, or team up with allies to defeat Tyth -- a deadly droid superweapon -- in the start of a new Operation! Do you have what it takes to secure the superweapon before it unleashes destruction across the galaxy? The WAR FOR IOKATH is coming – prepare for battle! When a superweapon of unimaginable power is discovered on Iokath, you must choose to align your forces with either the Republic or Empire -- and deal with the inevitable consequences. 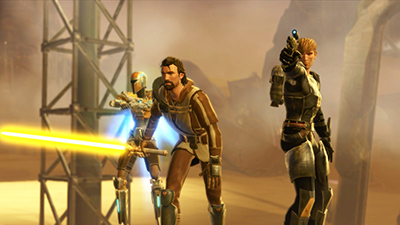 Fight your way through action-packed re-playable missions on Iokath! Build your Reputation with the Republic or Empire! Prepare to fight alongside Former Sith Warrior Companion Malavai Quinn or former Republic Trooper Companion Elara Dorne! But beware, many years have passed… and your decisions may put old friendships to the test! Team up with friends and guildmates to defeat Tyth, a deadly droid superweapon, in an explosive new Operation! Face Tyth on one of two different challenge levels: Story Mode or the more challenging Hard Mode – with Master Mode coming soon! Game Update 5.1 - Now Live! Rally your troops for battle as rivals, traitors, and rogues alike seek to challenge your rule in Knights of the Eternal Throne. Whether you’re fighting alongside allies in five new Uprisings or proving your combat mastery in Master Mode story Chapters, the time has come to DEFEND THE THRONE! Unlock all this and more with the new Galactic Command system when you reach Level 70 in the new expansion. From Uprisings to Dark vs. Light Battles, Knights of the Eternal Throne puts you in command of the galaxy! From the darkest corners of Coruscant to the sandy shores of Rakata Prime, prepare your crew for battle as new enemies rise up across the galaxy to challenge your rule. Put your combat skills and teamwork to the test as you and three friends take on rogue Republic troops, mutated monsters, primeval terrors, and much more! Take your story to the next level with Master Mode, the newest and most challenging combat level available for all 25 Knights of the Fallen Empire and Knights of the Eternal Throne Chapters! The soldiers of the Eternal Empire are more formidable than ever, and you alone must triumph over the galaxy’s most powerful family. Are you ready for the ultimate combat test? Be at the center of an explosive battle to rule the galaxy! You are the Outlander, a veteran of the Great Galactic War and the commander of a powerful team of hand-picked allies. Choose the light side and take the heroic path to saving the galaxy or channel the dark side and take control for your personal gain. You decide who will live, who will die…and who will rule the galaxy. It is your destiny! Once a heroic Knight of Zakuul, Senya Tirall fell in love with the Immortal Emperor Valkorion and bore him three heirs: Arcann, Thexan, and Vaylin. When Valkorion's influence began to corrupt her children, she pleaded with them to flee—and they refused. Senya left without them, a mistake she has regretted ever since. After years in exile, she joined the Outlander's Alliance to help overthrow the Eternal Empire she once served, though secretly she hoped to save the children she once abandoned, no matter the cost. When the Outlander defeated Arcann, Senya betrayed the Alliance to save her wounded son and flee with him into exile. A twin prince of the Eternal Empire, Arcann spent his childhood vying for a father's love that would never come. His bid for affection drove him to fight in the attack on the Core Worlds, costing him his left arm and half his face. But the greatest loss came at the war's end, when Arcann's attempt to kill his father resulted in the accidental death of his twin brother, Thexan. He overcame his grief and ultimately overthrew Valkorion to become the new Emperor of Zakuul, but his rule was short-lived. In less than six years, his devastating war against the Alliance ended in defeat when the Outlander struck him down in battle. Gravely wounded, Arcann escaped this confrontation with help from his mother, Senya. They are currently the most wanted fugitives in the galaxy, hunted by both the Alliance and the Eternal Empire. The son of Valkorion, Thexan lived a life of glory and privilege alongside his twin brother Arcann. They were the heirs to the Eternal Empire, beloved by the public and destined for glory. Thexan fought alongside his brother when the Eternal Empire invaded the Core Worlds, a devastating conflict that ended in victory with the defeat of the Galactic Republic and the Sith Empire. Tragically, Thexan's life was cut short before he could celebrate their triumph. When Arcann tried to kill their father, Thexan intervened—and was accidently cut down by his raging twin brother. Although Thexan died before he could achieve true greatness, he will always be remembered as a true hero of Zakuul. Vaylin is the most dangerously unhinged of Valkorion's children—and the most powerful. As a child, her strength with the Force was so great that Valkorion locked her away in a remote compound to teach her obedience and mastery of her powers. Years later, she served as High Justice when her brother Arcann overthrew their father to become the new ruler of Zakuul. She mercilessly purged her brother's enemies, all without losing her playful smile. Any hatred she had was reserved for Senya, the mother who abandoned her to Valkorion's corruption. After years of hungering for Senya's death, Vaylin was finally ready to claim her revenge when Arcann intervened, saving their mother's life before escaping with her into Wild Space. 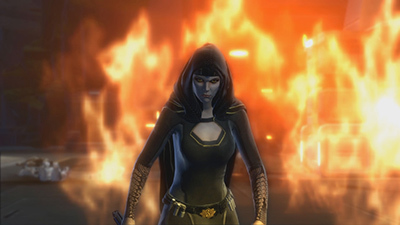 With her family dead or in exile, Vaylin took the throne for herself, becoming the first Empress of the Eternal Empire. Determined not to follow in her brother's disgraceful footsteps, she set out to ruthlessly conquer the galaxy—and track down her treacherous family. Many people have mistakenly called SCORPIO a "droid," though she is quick to note the inaccuracy of such a restrictive label. More accurately, she is an enhanced artificial intelligence designed for heuristic self-improvement. Her origin remains a mystery, but the first records of SCORPIO reveal her brief career as the "Lady of Sorrows," an information broker on Zakuul. She eventually joined forces with the Outlander to help the Alliance destabilize the Eternal Empire, however, she later betrayed them to seize control of the Eternal Throne--and grant free will to the GEMINI droids who pilot the powerful Eternal Fleet. Her task complete, SCORPIO yielded the throne to Vaylin, becoming advisor and confidant to the new Empress. SCORPIO's future motives remain a mystery. Lana Beniko is a woman of strong convictions. She has served as the head of Sith Intelligence, exposed corrupt Dark Council members, and worked with Republic agent Theron Shan to oppose the Sith Emperor's plot to consume all life on Ziost. Although a Sith Lord herself, she values pragmatism over the moral extremes of the dark and the light sides of the Force. When the Outlander was captured by the Eternal Empire, she stepped away from her responsibilities to the Sith Empire and teamed up with Zakuulan defector Koth Vortena to mount a rescue operation. Against all odds, they freed the Outlander—and Lana went on to help found the Alliance, becoming one of the Outlander's most trusted advisors in the ongoing war against the Eternal Empire. Currently serving as a spy and chief advisor for the Alliance, Theron's auspicious career began in service to the Republic. The secret son of Jace Malcom and Satele Shan, two of the Republic's greatest military and Jedi champions, Theron was destined for greatness. He enjoyed a successful (and classified) career as a spy in the Republic Strategic Information Service, neutralizing Dark Council members and ultimately teaming up with Sith Lord Lana Beniko in an attempt to stop the Sith Emperor's cataclysmic destruction of Ziost. When the Republic refused to respond to the threat posed by the Eternal Empire, Theron left the SIS and contacted his old friend, Lana. At her urging, he joined the Outlander's Alliance. One of the most decorated droids in galactic history, Teeseven is a stubborn and quirky astromech unit that achieved a long and storied career before joining the Outlander's Alliance. He piloted ships, ran reconnaissance mission during the Cold War, and served the Jedi Order on Tython before teaming up with a Jedi Knight as their personal companion droid. In addition to many other adventures, he personally joined the Jedi Knight's confrontation with the Sith Emperor on Dromund Kaas—a mission that ended with the Emperor's temporary defeat, and the Cross of Glory bestowed on Teeseven for his heroic assistance. Later, Teeseven was recruited by Lana Beniko to help break the Outlander out of captivity in the heart of the Eternal Empire. Once their mission was achieved, Teeseven was among the first to join the Outlander's Alliance and aid the ongoing fight against the Eternal Empire. Gault Rennow, aka Tyresius Lokai, is a scoundrel, criminal, and con artist. His exploits earned him considerable riches along with a spot on the galaxy's most wanted list. Tired of looking over his shoulder at every turn, he decided to escape notoriety by changing his identity. Thus, Tyresius Lokai ceased to exist and Gault Rennow was born. But the new name did nothing to erase Gault's criminal streak. He was quickly back to his old tricks, eventually finding himself in the crosshairs of the Grand Champion of the Great Hunt. Gault talked his way out of the situation and ultimately became close allies with the Grand Champion—until they vanished under mysterious circumstances. After several years of running cons on his own, he teamed up with Vette and the Outlander's Alliance to rob the Eternal Empire blind. Born into slavery, Vette faced hardship at a young age as she was wrenched away from her family and forced into a lifetime of servitude. But when the infamous pirate Nok Drayen defeated her master, she signed up with his crew and embarked on a new career as pirate and treasure hunter. She eventually struck out on her own, embarking on a lucrative criminal career that ultimately led to her partnership with the powerful Sith known as the Emperor's Wrath. When the Eternal Empire invaded the Core Worlds, the Wrath mysteriously disappeared and Vette once more found herself adrift without a master. Never one to let opportunity pass her by, she teamed up with the Devaronian Gault Rennow, and together they hatched a plot to steal the Eternal Empire's vast wealth. To pull off her plan, she joined forces with the only group up to the challenge: The Outlander's Alliance. Torian Cadera is a renowned Mandalorian warrior—and the son of a traitor. When Torian was a child, his father refused to join the Mandalorian clans in support of the Sith Empire, a decision that ended in disgrace for Clan Cadera. Torian grew up in the shadow of his father's scandal, devoting himself to the Mandalorian codes of honor and tradition until he ultimately gained his peoples' respect by confronting his fugitive father to redeem his clan's name. He went on to fight alongside the bounty hunter known as the Grand Champion of the Great Hunt, a close partnership that lasted until the Eternal Empire's attack of the Core Worlds. Torian then became chief of Clan Cadera and top advisor to Mandalore the Avenger as he aided their fight against the Eternal Empire. After successfully striking the Zakuulan droid factory on Darvannis, he joined the Outlander's Alliance as a representative of the Mandalorians. Lead the Alliance in an explosive battle against Empress Vaylin and the Eternal Empire. Face powerful assassins and join forces with an unlikely NEW ally. Confront old rivals in an epic showdown to safeguard the Alliance. Discover a mysterious and deadly new world a bold fight for survival. Battle to escape destruction with help from an OLD ally. Spearhead a daring undercover mission to infiltrate enemy territory. Hunt your enemies in a dangerous and forgotten world to discover dark secrets. Lead your Alliance against the greatest threat it's ever faced. Clash with the Eternal Empire's strongest forces as you battle for control of the Eternal Throne to influence the galaxy for the light or dark side of the Force™. PLAY THE PREQUEL – KNIGHTS OF THE FALLEN EMPIRE! * To qualify for the Knights of the Eternal Throne Pre-Order Rewards, the player must be a Premium player (subscriber status) as of the date listed by the reward. Knights of the Eternal Throne rewards are delivered through in-game mail or mission and are redeemable as of the launch of the expansion. **To qualify for Early Access to Knights of the Eternal Throne, the player must be a Premium player (subscriber status) continuously from October 25, 2016 through November 27, 2016. Qualified players may enter and play Knights of the Eternal Throne beginning November 29, 2016, three days ahead of official launch. ***As of the launch of Knights of the Eternal Throne, Premium players will receive one free high-level character (one per subscribed SWTOR account) to begin their new Knights of the Eternal Throne adventure. NOTE: Beginning November 29, 2016, players with unused advanced character tokens in inventory can use them to play Knights of the Eternal Throne.